The most common woods used are maple and oak, but if you are looking for a specific wood for your bed let us know. Any wood can be used, their just might be a price difference . 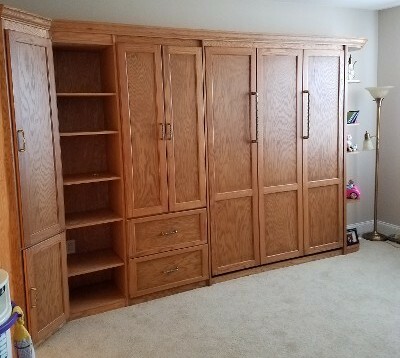 Make your home more comfortable and accessible than ever with a custom-designed Murphy bed. At USA Murphy Beds & Cabinetry, we design a variety of beds for people and their furry friends. 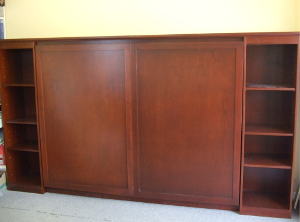 Our Murphy beds are manufactured from the best quality materials with all cabinetry constructed of 3/4“thick plywood. What sets us apart from other products is our Workmanship, only Maple or Oak wood products are used to construct your custom order. If you are interested in us building in a different type of wood, please contact us for pricing. We can accommodate up to a 12” thick mattress. Our mechanisms ensures adjustable tension and lightweight operation to ensure easy and safe use. There is no need to secure through the floor, allowing your bed to be relocated at a later date. We offer a lifetime warranty on our spring mechanisms. Our Traditional Raised Panel (TRP) Murphy Beds are manufactured from the best quality materials with all cabinetry constructed of 3/4" thick plywood. We make designs for twin, full, queen, and king size. Our design can accommodate mattresses up to 12" thick. Its adjustable spring tension mechanism ensures lightweight operation and is safe to use. There's no need to secure through the floor, allowing the bed to be relocated at a later date. Our mechanism comes with a life time warranty. Our Framed Flat Panel (FFP) Murphy Beds are manufactured from the best quality materials with all cabinetry constructed of 3/4" thick plywood. We make designs for twin, full, queen, and king size. Our design can accommodate mattresses up to 12" thick. Its adjustable spring tension mechanism ensures lightweight operation and is safe to use. There's no need to secure through the floor, allowing the bed to be relocated at a later date. Our mechanism comes with a life time warranty. Our Plain Panel (PP) Murphy Beds are manufactured from the best quality materials with all cabinetry constructed of 3/4" thick plywood. We make designs for twin, full, queen, and king size. 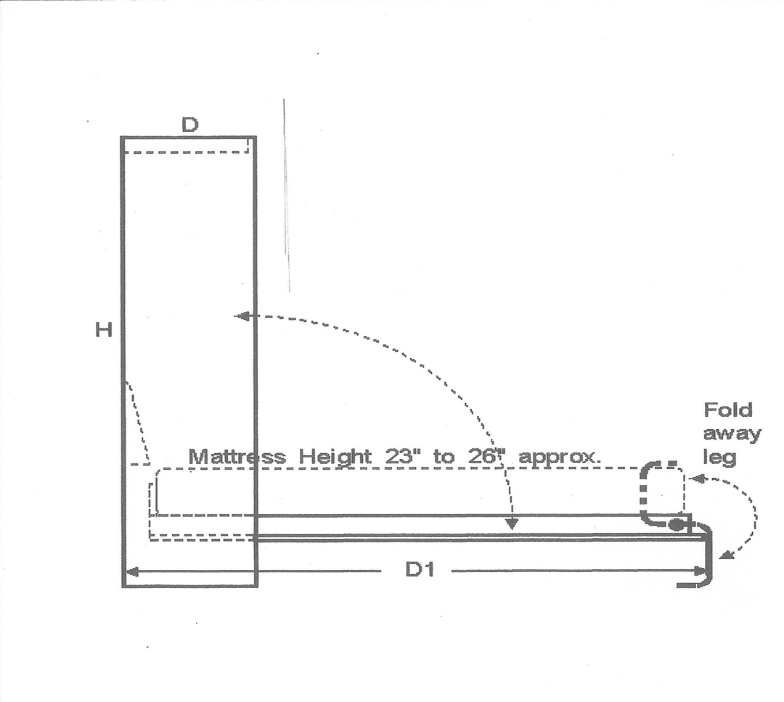 Our design can accommodate mattresses up to 12" thick. Its adjustable spring tension mechanism ensures lightweight operation and is safe to use. 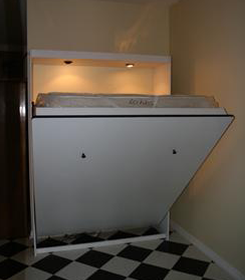 There's no need to secure through the floor, allowing the bed to be relocated at a later date. Our mechanism comes with a life time warranty. 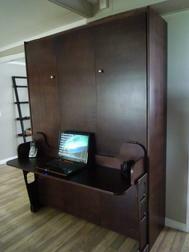 Store your bed away in the morning so you can easily resume your work or studies. 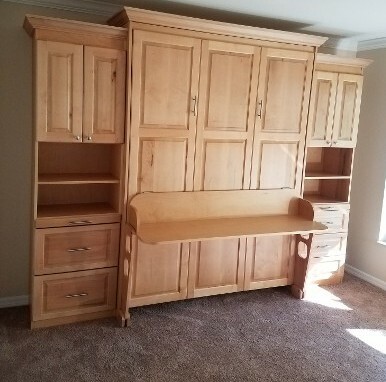 Our Desk Murphy Bed allows the user to leave their personal items such as a laptop, printer, and books (up to 10" high) on the desk while the bed is pulled down. It retains its horizontal position and tucks under the bed for a comfortable night. We manufacture our beds from all wood products. 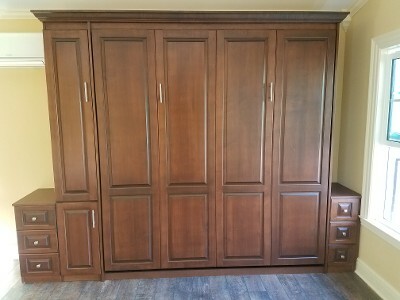 The Horizontal Murphy Bed (also referred to as a side mount) is ideal for a room that has obstructions to allow for a standard vertical Murphy bed. Available sizes are Twin, Twin XL, Full, & Queen. Don’t see what you’re looking for – send us your ideas! Your pet is part of the family, so you may as well treat them as such. 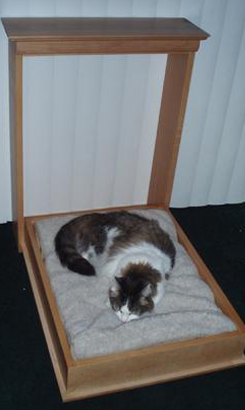 Our Murphy beds are now available for your pets. These can be used as space savers in your home, RV, or boat. They are manufactured from solid wood, such as maple or oak plywood. They also come with a thick-padded mattress. They come in a variety of sizes, such as small, medium, large, and extra large.